Shades of Green > Blog > Insects & Pests > What are the Best Plants for Butterflies? What are the best plants for butterflies? That’s a common question at the garden center this time of year, often triggered by customers noticing the different species of butterflies fluttering about our wide selection of plants. The answer isn’t as straightforward as you might think. Many people assume that any plant that flowers will attract butterflies. That isn’t the case. Some human favorites, such as roses, camellias, petunias, and begonias, may draw bees but are typically ignored by butterflies. Since we’ve been asked a lot over the years, we’ve have complied a list of Top Ten Native Perennials for Butterflies, however that list is only part of the answer. There are also annuals that attract butterflies. 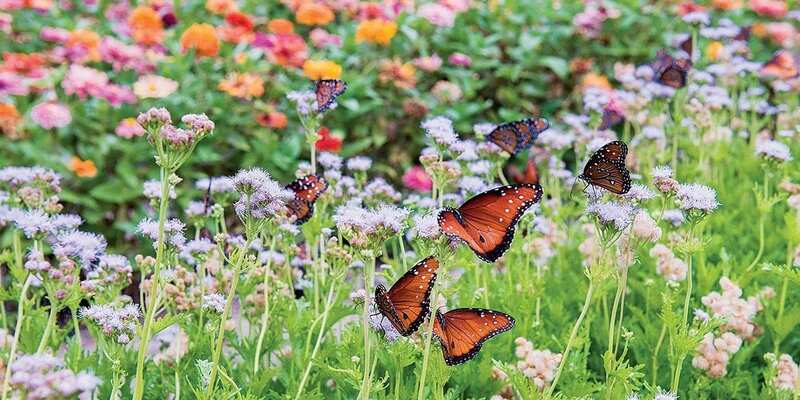 Consider cosmos, marigolds, pentas, and zinnias when planning a butterfly-friendly flowerbed. A Monarch taking a nectar break on it’s host plant, Milkweed. Whether planting native plants, perennials, or organic plants, understand that butterflies are seeking two types of plants; nectar plants for adults to feed on, and host plants for their offspring (caterpillars) to feed on. A butterfly garden that contains both nectar and host plants will draw more butterflies because they’re more likely to lay their eggs on the host plants. Butterflies are very selective when it comes to host plants and most species will only lay their eggs on one type of plant. Monarch and Queen butterflies only lay eggs on types of milkweed. (Ask our staff about tropical milkweed, an easy growing, re-seeding annual.) Gulf and Variegated Fritillary caterpillars feed on passion vine, while caterpillars of the Pipevine Swallowtail prefer pipevine, and Black Swallowtails prefer the herbs dill, fennel, or rue. Thus, while you can feed nearly all species of adult butterflies with nectar plants such as penta, coneflower, aster, yarrow, and others, you’ll need specific host plants to attract specific species. Otherwise, the adults may stop for a bit of nectar, but won’t stay long enough to lay eggs. To find out what host plants are preferred by which species, visit the North American Butterfly Association and check out their Regional Butterfly Guides. Click on the map for the Dallas-Fort Worth Guide then come to Shades of Green and let us help you find the plants you need to attract the butterflies you want. 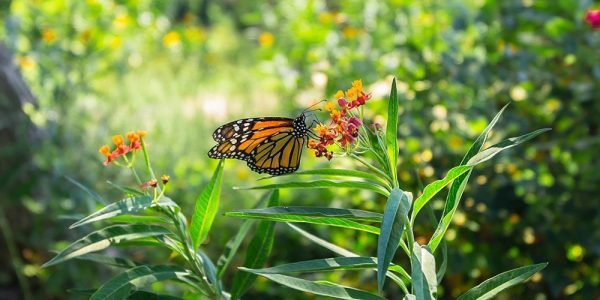 Tim Wardell is a Texas Certified Nursery Professional whose backyard is a Certified Butterfly Garden (#769) by the North American Butterfly Association.